The Royal Knights are like the "rock stars" of the Digimon franchise. Digimon with this status enjoy benefits like, appearing regularly in the card game, having important roles in the anime/manga, and popularity. However, Duftmon's case is pretty peculiar. Duftmon appeared in Digimon Savers (and died), appeared in several cards (one being a promo), received a mode change, and a X-antibody variant, all in a relatively short time span. Duftmon's origins are quite ambiguous. He is similar to the light hybrids and dark hybrids; because of his German influence. Duft is German for smell, however how this applies to the Digimon is unknown [judging from his hair, he does seem to have good hygiene]. Due to his name and black & white appearance, many speculated that Duftmon was based on a skunk, however this was proven false when Leopard Mode was revealed, besides, Duft refers to good fragrances. Duftmon seems to be based on traditional European knights. Duftmon's dark beastly humanoid appearance could also possibly be based on Lowemon (and even Reichmon). Incidentally, Lowemon's name is German [meaning Leo] and also has German attacks. Both Lowemon and Duftmon also have similar looking quadrupedal evolutions [Kaiser Leomon and Duftmon Leopard Mode respectively]. Coincidentally, both Duftmon LM and Duskmon also share an attack named Eroberung. Duftmon is described as the Royal Knight's greatest strategist, who works behind the scenes and rarely appears in battle. His intellect is so esteemed, that everyone including the most insubordinate members obey his commands. However, when it comes to fighting, Duftmon is also a force to be reckoned with. He can deliver powerful blows from his rapier, with attacks like, Ernst Wehr [earnest resistance], and Aussterben [extinction]. When Duftmon needs to gallop around the battlefield, he "mode changes" into Duftmon Leopard Mode, a more offensive capable form. Duftmon's X-antibody variant was also recently revealed, making him the latest X-antibody Digimon to be made in years. Like the other Royal Knights, Duftmon X is decorated with gem stones, has a bulkier armor similar to Alphamon, and overall a more sharper image. Out of all of his evolutions, only Duftmon X's attack Braun Nebel [Brown Mist] seems to reference Duftmon's name. However, even though Duftmon has several different forms, he still doesn't have a "recognized" evolution line. 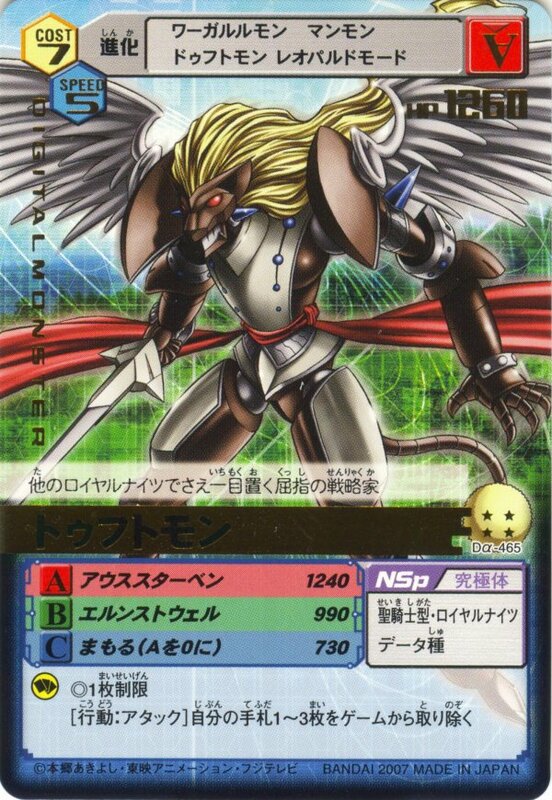 According to the card game, he can evolve from Were Garurumon or Knightmon (a common pre-evolution for the Royal Knights). Duftmon's existence was first confirmed to the English speaking audience in April 28, 2007. He appeared in episode 43 of Digimon Savers which aired on February 10, 2007, as the "Monster of the Week" who battled against Rosemon Burst Mode and Ravemon Burst Mode (and lost), and was voiced by Murozono Takehiro. However, while Duftmon's role was quite short, he exploded outside the anime. Even before Duftmon appeared in Digimon Savers, the official Digimon WEB blog buzzed about Duftmon's secret, which was later revealed to be Duftmon Leopard Mode; probably the fastest a Digimon ever received a mode change. 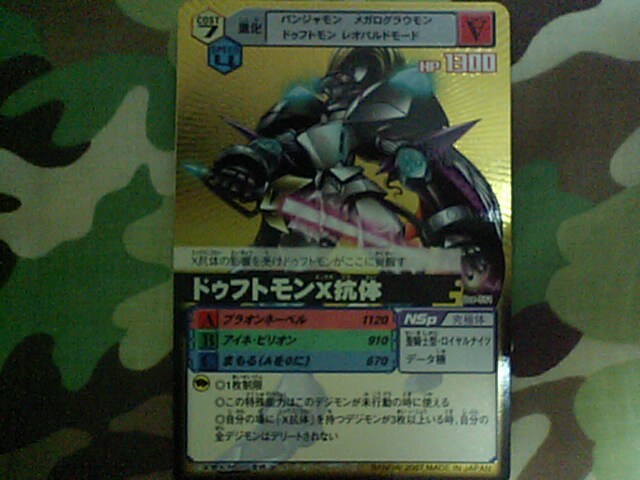 Duftmon was also chosen over several Royal Knights (e.g. Craniummon) to appear in Digimon Story Sunburst & Moonlight [US: Digimon Word Dawn & Dusk]. 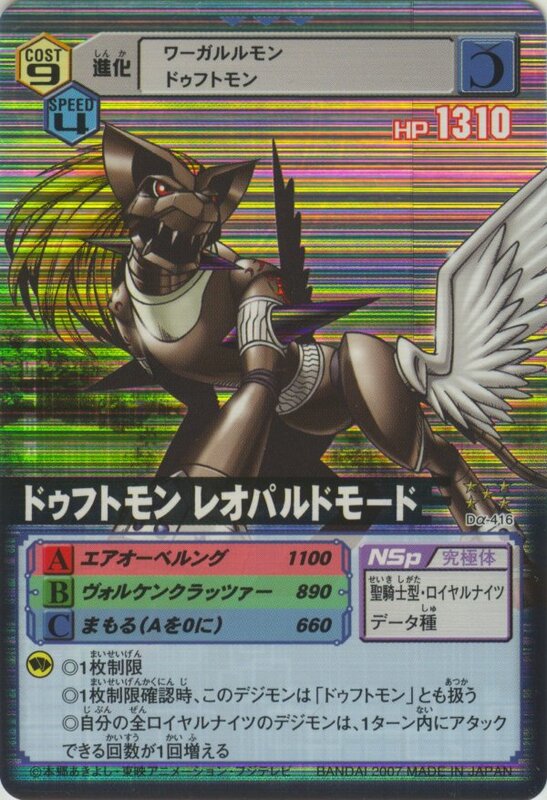 Duftmon X-Antibody also appeared in the Digimon Card Game Alpha X-Antibody x Hybrid set as an ultra rare; he already had two cards before (three if you count Duftmon Leopard Mode), one of them was a promo given out in the Greatest of Digimon (GOD) event. While the reason why he is named Duftmon is still unknown, this Digimon has made a splash this year, particularly this month with the unveiling of Duftmon X. Although, this probably isn't the last of him, as Duftmon still has yet to appear in the Battle Terminal arcade game, have a role in manga, or receive his own unique evolution line. However, this Digimon has proven that anything is possible.